Boy, those DOT guys sure do have a sense of humor! Undefined? Could it be a divide by zero error? If grade percentage is vertical distances divided by horizontal distance, the grade is only undefined if the horizontal distance is zero… which is the case for cliffs, ledges, and other discontinuities. It may be safer to take an alternate route – at least something where the grade is numerically tractable. Gotta love the road signs. I’m thinking that someone simply forgot to print/paint in the appropriate number, as the % is off to the right. 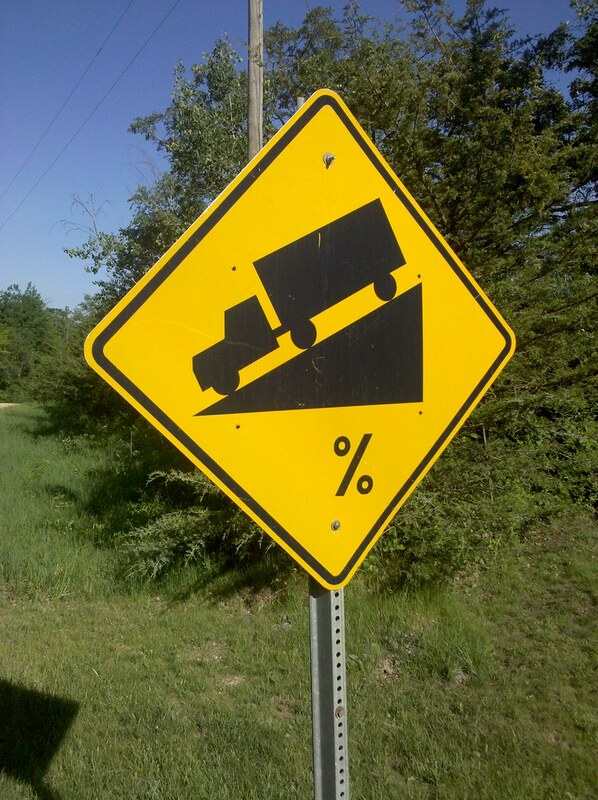 Nah… it means your percentages of making it ain’t good in a big truck going down that steep hill! Who put the sign post in backwards ? The guy who was promoted to measure the grade of the slope and paint it on the sign, of course! My guess it was Sven or Olie. If they had asked Lena to do it, Matt wouldn’t have had the opportunity to share his acute observational skills with us. This will be on the trig final.